A Follow Spot: A Refreshing Kind of Princess in "Brave"
There's a long tradition of animated Disney princesses enchanting young girls, all the way back to Snow White (1937) and Cinderella (1950). These days, Belle and Jasmine and Ariel and Tiana, even Mulan and Pocahontas, get trotted out at the Magic Kingdom, have tea parties with young visitors, dance and sing on video, sell costumes and hats and clothing and the entire Disney Princess concept. The newest princess is a bit of a departure, however. 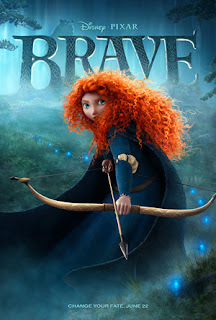 She's Merida, the feisty Scottish redhead at the center of "Brave." Actress Kelly Mcdonald provides her voice, making her as appealing as she is rambunctious. Like Belle, she is smart and devoted to her family. But unlike any other Disney princess, Merida doesn't have a Prince Charming. And, in fact, the whole hook for the plot is that she doesn't want one. Yet, anyway. She'd rather run and climb and ride than settle down to any kind of domesticity. The action begins when Merida's well-meaning mom, given vocal warmth and grace by Emma Thompson, gathers together the three main suitors for Merida's hand. There are scions of the Clan MacGuffin (the old and young MacGuffins are voiced by Kevin McKidd), Macintosh (the head Macintosh is Craig Ferguson) and Dingwall (the big Dingwall is Robbie Coltrane), but none of these boys is anyone Merida is interested in. When they take bows in hand to battle for her hand, Merida jumps in, outdoes them all on the archery field, proclaiming she had just won her own hand. That sets everybody fighting with everybody, including Merida's dad, the formidable Fergus (brought to life by Billy Connolly), and puts Merida and her mum at loggerheads. So Merida runs off on her trusty steed, hurtling past some of the most gorgeous scenery Pixar's artists have ever created, into a scary world of standing stones, lochs, brochs and crumbled towers. She also runs into a witch. And a variety of bears. Because Merida is impetuous and headstrong, because she insists on being master of her own fate even though she's way too young, she makes a bad decision, which results in danger and devastation for her mother. Their attempt to restore the mother-daughter bond and mend the family makes up the rest of the plot. There are small bits of humor in "Brave," although the main mood is dark and wild. Pixar has gotten so good at making things look real that some sections of the movie were too scary for me, let alone a young child. But then, the death of Bambi's mom still haunts me, so... You can draw your own conclusions. Or maybe Merida doesn't need a romantic sequel. Maybe she can be her own Warrior Queen without a king at her side. Why not?